Istanbul - Morocco was once home to a very large community of 250,000 Jews, the largest in the Arab world. Moreover, they had been living there for the past 2,000 years: In other words, together with the Muslim Moroccans, they were an inseparable part of Morocco, its culture, history and civilization and helped build and shape it to make it what it is today. For centuries, these two communities existed side by side in harmony and friendship. They lived in similar houses, led similar social lives, attended the same schools, worked at the same jobs and spent great time together as friends. Istanbul – Morocco was once home to a very large community of 250,000 Jews, the largest in the Arab world. Moreover, they had been living there for the past 2,000 years: In other words, together with the Muslim Moroccans, they were an inseparable part of Morocco, its culture, history and civilization and helped build and shape it to make it what it is today. For centuries, these two communities existed side by side in harmony and friendship. They lived in similar houses, led similar social lives, attended the same schools, worked at the same jobs and spent great time together as friends. However, when the Nazi-inspired Vichy regime began its anti-Semitic practices, the days of troubles began. The French administration even ordered that the Jews in the country wear yellow stars as an identification of their Jewishness. But King Mohammed V of Morocco, a figure deeply beloved by Jews, famously denied the request and said, ‘There are no Jews in my country, only subjects’. It is even reported that the King asked for yellow stars for himself and for his family as a show of solidarity. Despite intense French pressure, the King refused to make any separation between his people and during the annual Throne Day Ceremony, in the presence of Vichy officers at the royal palace, welcomed the leaders of the Jewish community and said, “I must inform you that, just as in the past, the Israelites will remain under my protection. I refuse to make any distinction between my subjects.” He is also known to have helped a group of prominent Jews hide in his palace from the prying eyes of the Vichy authorities. The efforts of the King are still remembered by the Jews today as they lovingly pay tribute to him. But as good as the intentions were of the Moroccan government, darker days were beginning for the Muslim-Jewish friendship that would eventually tear them apart. When the State of Israel was founded in 1948, rising anti-Jewish sentiment and a powerful propaganda machine increased the uneasiness Jews felt and caused them to leave Morocco in droves for Israel. There was another wave of migration due to anti-Semitism and thus they left the region during the years 1956 to 1967. Today, the number of Jews in the country is down to a mere 2,500. Today, the echoes of this painful separation can still be felt on the streets of Morocco and in the words of Muslim and Jewish Moroccans. An elderly Moroccan man lovingly reminiscences of the old days when his Jewish friends were around: ‘I helped them load their baggage onto the buses. With them, their beautiful food was gone. We didn’t want them to leave. We no longer danced the traditional Ahwach’. The sellers explain how the marketplaces buzzed with activity when Jews were around and the Moroccan Jews that left during those days explain how they never stopped missing their homes in Morocco. Pinhas Suissa, a Moroccan Jew returnee, spoke about how the Moroccan Jews stuck together in Israel and formed an Ahwach’ band to play music all night because they didn’t want to lose their ties to Morocco; the ones that chose to stay, despite the risks, proudly say that they never regretted their decisions as the anti-Jewish rumors turned out to be rumors only. 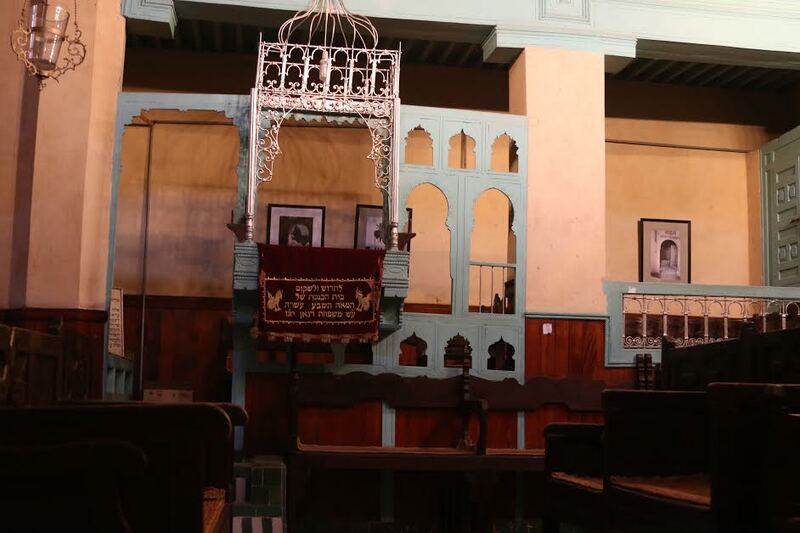 Although the younger generation isn’t as familiar with the Jewish past of the country, they still respectfully watch the Jews coming back to Morocco, either as permanent residents or tourists. Even today, the two communities manage to keep their solid connection intact despite traumatic incidents that put their friendship to test. For instance, when a Jewish community center in Casablanca was attacked 13 years ago, killing 40 and injuring 100, Israeli government officials called on Moroccan Jews to resettle in Israel. But the Jewish residents of Morocco preferred to stay and the General Secretary of the Council of Jewish Communities of Morocco said Jews were comfortable in Morocco and had no intentions of leaving. Morocco is a good example in that it shows how two different faith communities, perceived by many to be enemies, can in fact harmoniously co-exist with mutual love and respect. Needless to say, things weren’t always perfect; there have been times when undesirable incidents happened – and still do from time to time- but they do not reflect the general feeling of the communities, and such incidents are mostly solitary cases. Love and friendship have their ways to win, and as the Moroccan case clearly shows, there is a possibility to keep away from conflicts or keep the bickering of politicians away from people’s daily lives and maintain good relations on a grassroots level. God loves love, peace and friendship, especially between different cultures, civilizations and nations. That’s why He so beautifully created this amazing diversity in our world. In a Qur’anic verse, our Almighty Lord explains that the reason we are created as different nations is so that we can get to know each other. (49/13) The Moroccan Muslims and Moroccan Jews have come to appreciate this beauty and gave a great lesson to the world. Having this great culture of co-existence, friendship and mutual respect, we believe that they can achieve even more and show to the rest of the world how two communities can love, respect and co-exist peacefully with each other, despite differences.